At our little Japanese corner restaurant, they serve an incredible appetizer called Agedashi Tofu which I’ve also seen on menus elsewhere. 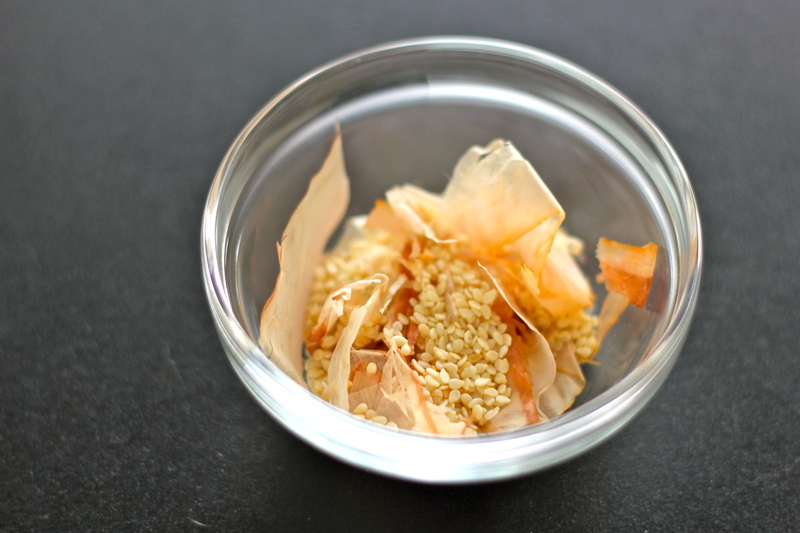 From what I gather, it’s a classic Japanese preparation of silken tofu, and it’s topped with these fantastic flakes of dried, smoked codfish called “Bonito flakes”. I did about five minutes of internet research and found out that these little flaky guys are incredibly versatile and you can do just about everything with them, from flavoring soups and stocks to putting them between two slices of Wonderbread and calling it breakfast. 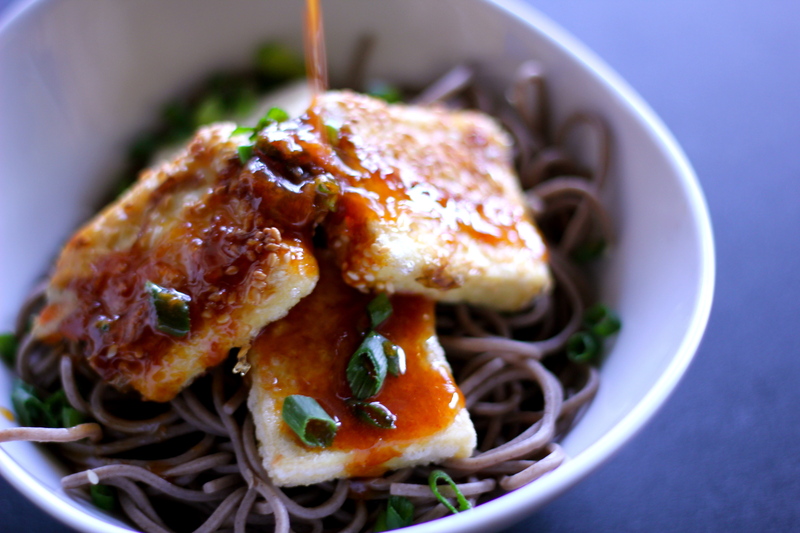 I tried this recipe over lightly dressed soba noodles and some gingery broccolini…it might not have been authentic Japanese but it sure hit the spot. This looks really complicated (I’m still, um, learning how to write a concise recipe), but if you do the prep in advance, this comes together really quickly. You could prepare the tofu, broccolini, and dressing all a day ahead and let them sit (covered) in the fridge. Then it would take you probably half an hour before you could be enjoying this delicious, healthy bowl of goodness. If you can’t find bonito flakes (or want to make this a vegan dish), just dip the tofu in cornstarch and fry it up, it’s absolutely fantastic. The dressing adds all the flavor and the tofu is crispy and soft all at once. Let me know what you think! Note: Make sure you get firm tofu, not extra-firm. You want this to be crispy on the outside and silky smooth on the inside. If the ingredients look difficult to find, you can probably find them at your local Whole Foods, although I’d recommend patronizing an Asian grocer or co-op first—you’re likely to get a more varied and interesting selection. Use any vegetable you like in place of the broccolini—regular broccoli or green beans would both make excellent substitutes. First, get your big pot and your medium saucepan and fill them both with water. Salt the heck out of ‘em and set them over high heat to boil. Slice your tofu into strips ¼ inch thick and 1 inch wide. Lay them out flat on a couple of paper towels and place two more paper towels on top. Press down and let them drain while you make the dressing. Combine the zest, ginger, honey, cayenne, and salt in a bowl and either whisk it together or use your hand blender. (You can also use a food processor if you have one.) When the mixture is smooth, add the lemon juice, soy sauce, and vinegar and whisk or blend to combine. Drizzle in the oils while the blender is running or while you are whisking vigorously. Cover, refrigerate and let the flavors meld while you prepare the rest of the meal. Now, the broccolini: Whisk together the oil, soy sauce, and hot pepper flakes in the last shallow bowl. Your small pot of water should be boiling by now. Move your bowl of ice water close to the range. Dump the broccolini carefully into the bubbling water and let it cook for two minutes, no more. Using your slotted spoon, lift the broccolini out and dunk it in the cold water to stop the cooking. Lift it back out, shake a little to drain it, and place it in the bowl with the marinade. Once it is all transferred, mix the sauce and broccolini all together so the flavor gets into all the nooks and crannies. Now we’re in the homestretch. Put your noodles into the big pot of boiling water. Follow the package directions. They should cook for about 6-8 minutes, which is how quickly everything else will come together. Set your colander in the sink to prepare. When they are cooked (err on the side of undercooked rather than overcooked), dump them into your colander and rinse them in hot water. Heat a tablespoon of coconut or vegetable oil in your sauté pan over medium-high heat. Dump the broccolini and marinade into the hot pan and toss to brown it on all sides. After about three minutes, push the vegetables to the side of the pan and scrape your chopped ginger into the center of the pan. Let it cook for about thirty seconds to a minute, until it is fragrant, then stir everything back together and turn up the heat to medium high. After two minutes, when the broccolini is taking on a nice brown crispy character, slide the contents of the pan back into the shallow bowl and cover with foil to keep warm. Wipe out your sauté pan and keep the heat at medium. Heat two tablespoons of oil in your pan for about two minutes, until it shimmers. Have a plate covered in paper towels ready. Carefully place your tofu into the pan, one at a time. Cook each piece for two-three minutes on each side. 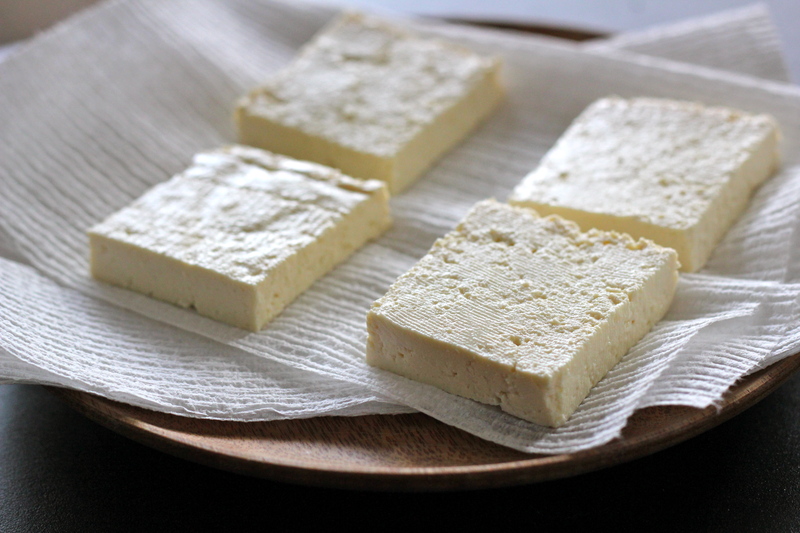 Transfer the crispy tofu onto your paper-towel covered plate to drain excess oil. To serve, divide the noodles between four bowls, and place a few pieces of broccolini and tofu on top of each. Whisk your dressing one more time and pour about two tablespoons over each bowl. Garnish with chopped green onions and sesame seeds and pass the remaining dressing at the table. That bowl of food looks really great, and I mean that. The photography is perfect. frugal, thank you so much! i was struggling a bit with capturing the pouring liquid. glad you read and enjoyed! Oh god. I will now be singing “La Isla Bonita” in my head for several hours. This looks delicious. 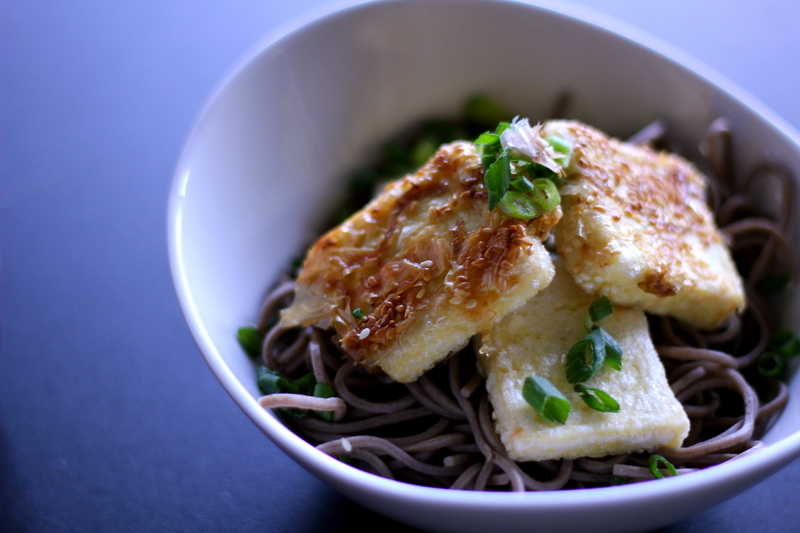 I’ve never cooked soba noodles, but it seems easy. I also love those cheap Wai-Wai noodles because all you have to do is stick them in a bowl of hot water and then drain after five minutes. Plus they are really beautiful and delicate.